I'm keeping this post short........I've been having these recurring headaches almost on a daily basis for about 3 weeks now. I can't for the life of me figure out what's going on. They aren't migrains.....just enough pain to be annoying really. I had been taking ibuprofen with no help and I read online that continual usage of ibuprofen can actually be a cause. So I stopped that a week ago. I'm trying to drink more water. ....................but if any of you have suggestions or tricks to stop headaches, lay them on me. I'm ready to do anything. I can't believe that I didn't twig on to the tim's sally name being a tim burton reference...how dumb am I? lol!! 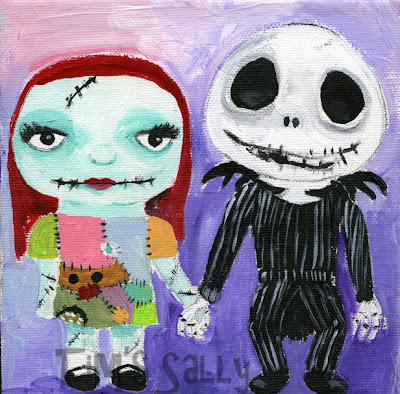 Such a sweet painting, I love how you did them totally in your style. oh Mindy...i love this painting!!!! i am so sorry about your headaches...do you drink caffeine and if so, have you cut back?? sometimes that is a big trigger. i was going to suggest drinking more water since headaches can be brought on by dehydration. or what if you do like advil first and then 4 hours later switch to tylenol??? i also agree with Micki...a nice glass of red wine at night could be of help!! sending love and wishes for a headache free day!! this is so gorgeous, i can't believe i've only just found you... i love your work. sorry about your headaches, i have exactly the same type of headaches/migraine - so much pain and nothing worked - i think it's monosodium Glutamate (MSG) poisoning, it has about 15 different names and it's difficult to cut out completely, but the "yeast Extract" version is a real problem for me. I'm feel a lot better these days. Oh my How are you feeling today sweets. I hope you are okay. If it continues please do go to the doctor to have that checked out. Drink lots of water and herbal tea. I love this adorable piece!!! And I'm in love with Tim Burton's work.as well. I love the new painting! So cool. I hope your headaches are better this week! Mindy, sorry to hear about your headaches. Wisdom teeth? That was the cause of some of my horrible headaches. I love your work.